Spring has sprung, so let’s get some cleaning done! Our closets don’t have the capacity to hold on to everything, and neither do we. We have to make room in our lives for what’s necessary for us. What should we throw away? What should we keep? 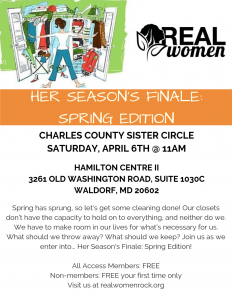 Join us as we enter into… Her Season’s Finale: Spring Edition!